With many aspects of running, runners and coaches tend to speak in absolutes. High mileage is the best way to train for a marathon; runners need to include yoga to prevent injury; and negative splits are the surefire way to PR in your next race. Of course, many of these become absolutes because overall these are the best ways to train for most runners in most scenarios. High mileage benefits marathoners significantly more than running only 20 miles per week to prepare for a 26.2 mile race. I’m over here in some weird state of not having done yoga for months and feeling better than ever in my running. And negative splits, believe it or not, may not be a guarantee of a PR in the marathon (and likewise, positive splits do not necessarily indicate a poor race) – especially if you review the statistics found in this Runner’s Connect article on marathon pacing. You most often read about the benefits of negative splits for long distance races, namely the marathon and half marathon. Several coaches, myself included, swear up and down by negative splits as the tried and true way to run a PR and avoid the wall. For the half marathon, I firmly believe that negative splits are one of the best pacing strategies. For the marathon, however, pacing becomes trickier. Pro: Negative splits race strategy decreases your chances of slowing down and suffering later in the race. Of course, by definition, you don’t slow down later in the race when you run a negative split. 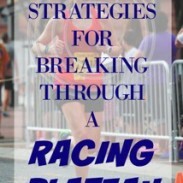 Deliberately planning and executing a race strategy for the half or full marathon in which you start slightly slower (emphasis on slightly) than race pace will push off the accumulation of lactate, conserve your glycogen stores, and keep you from getting swept away in the adrenaline of race day. Essentially, the purpose of negative splits is to avoid hitting a wall and avoid trashing your muscles early in the race. Con: A negative split is difficult to run in the marathon. Most runners do not run negative splits in the marathon. No matter how well you train, fuel, and pace yourself, the marathon is unpredictable. Of course, the high likelihood of running a positive split in a marathon does not mean you should run the first half of the race (or even the first few miles) too fast. Start slightly slower or at your goal pace and then hold onto it as long as you can. Banking time early in the race is never a smart strategy, while keeping your pace under control, even if you do run a minor positive split, will set you up for success. Need convincing? Read Run Far Girl’s article on how following a smart pacing plan helped her run a 23 minute PR in the marathon. If you slow down in the last 10K of a marathon, don’t beat yourself up about it – statistically speaking, most runners slow down over the last half of a marathon. Do not give a few slower miles the power over your race. Trust your training, trust your race plan, and – most of all – trust yourself during the race. Pro: Negative splits build your confidence. Falling short of your time goals happens and is part of the journey to becoming a better runner. However, repeatedly missing your goals and suffering at the end of races can be a blow to your confidence. Whether or not you PR or achieve your time goal, a negative split increases your chances of running a consistent and strong race, which builds your confidence. And, let’s be honest – passing other runners in those last few miles, especially those who zoomed ahead of you at the start of a race, will significantly improve your self-perception of your abilities as an athlete. Con: A negative split does not work on all race courses. A race that start out downhill and finishes with a climb may result in a positive split, even if you run at an even effort, just by virtue of physics. The same pace requires more energy on the uphill and less energy on the downhill. Think of the Boston Marathon, where you can expect to slow down over the Newton Hills, even if you were smart and did not start out at too fast of a pace. I do believe negative splits are the best race day strategy for a half marathon, based on my own experience and what I’ve seen in other runners. The marathon, however, is such a beast that there will be pros and cons to any race strategy. Most of all, you must go into the race with a smart plan but the ability to adapt to what the race throws at you. Whether a negative split strategy works for you in racing or not, most runners will benefit from not starting out faster than their goal pace. You should intentionally take time to warm up, whether you run a few miles before the race or start at a slightly slower pace. Rather than stressing over exact splits, race by effort. Race pace will feel easier at the start of a race and harder at the end. Whether you run a negative or positive split, being attuned to your effort will help run a successful and enjoyable race. Most of all, find a race strategy that will help you enjoy the race. Because if you’re not enjoying most of the race (arguably no one enjoys the pain of those final miles), why do it? Do you try to run negative splits in a race? What’s your approach to racing a marathon? What’s one popular piece of training or racing advice that you don’t follow? I have always run negative splits. Not intentionally. 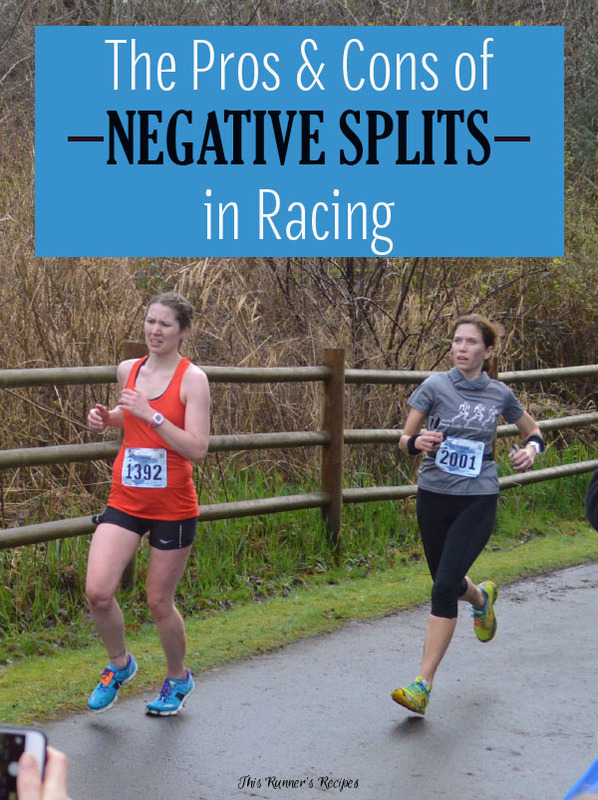 You hear so much about the pros of negative splits so it’s great to read about the cons. Thank you! The pros do outweigh the cons most of the time, but it’s interesting to know that negative splits aren’t always necessary or the best strategy. I always start out a little slower in the marathon and I have actually run negative splits in most of them. The only time I didn’t was when I went out to fast and hit the wall. Sometimes I worry about going out too slow but looking back on my splits, I usually realize that by starting slower I was able to run a strong and consistent race. I think 5ks are really tricky because there is no opportunity to make up time if you go out too slow! 5Ks are definitely hard to negative split! I think even splits would be best for that, along with a long warm up to get ready to run that fast. That’s so awesome you’ve negative split at most marathons – and it must be an amazing feeling to run a strong and consistent marathon! I am a negative splitter, but that is what works for me. I give my clients negative splits in our training to help them learn to gauge pacing, and see if they like it. But I agree, there is a pacing strategy for everyone, and the marathon might not be the best time to try a negative split! But they seem to work for me! I love negative splits and/or progression runs in training to teach pacing! I definitely would have a runner (and myself) try out negative splits in a shorter race before a marathon. Any sort of pacing strategy is tricky in the marathon! I tend to try for negative splits, but of course they don’t always happen. Then again, I’m only half crazy. Sometimes I have them; sometimes I’m pretty consistent the whole race; and sometimes it’s positive splits! Often it’s actually a bell curve — faster at the beginning & end, slower in the middle. The middle miles are always where it’s hardest to stay on pace! Especially in a half marathon and marathon where those middle miles last for a long time. I have yet to run a negative split race but hopefully, it will happen one day because for me, it would mean I paced myself well. I think going by effort like you say is the best way to do it, not focusing so much on the exact pace but making sure you don’t go all out at first only to burn out later — that is not a good feeling! I think it will happen soon for you! Effort is definitely a great strategy, especially starting at what feels like an easier effort – because after training and a taper race pace will feel easy for quite a few miles! I always look at the course ahead of time to figure out my race strategy. Like you said, it doesn’t work on every race! I recently ran a half that had a HUGE hill from mile 6 to 9, so I knew I wanted to start faster than usual, take it easy on the hill, and then kick it up at the end. It wasn’t a negative split but it was the best I could do for that race and earned me a PR! 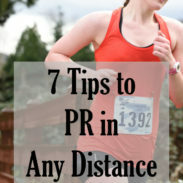 That sounds like a smart strategy for that course – and congrats again on your PR! Hills should definitely be taken easier, no matter where they are in a race. I don’t try to run negative splits as I mostly try to avoid going out too fast. This means I try to start at the pace that I hope to finish at, although sometimes I do get caught up in race day excitement. For me, when I start out at the pace I want to finish in, from 5K-half, I have an excellent race. I know a lot of runners who are super excited about “negative splits” and want to negative split every single run. If you start your run at a 9 min/mile pace and end at a 7 min/mile pace, that is not a negative split… that is called a progression run. I start out slower in the first mile of my training runs because it takes me a mile or two to warm up since I run in the mornings and haven’t done any activity yet that day. Do you warm up a lot before the half? 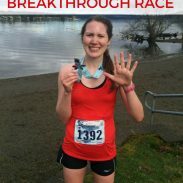 I (and so many other runners I know) have such a hard time jumping into race pace! That said, like Hanna pointed out below, even splits are found to be an excellent strategy for the longer races. And for a 5K even splits are definitely the way to go. I don’t warm up before half marathons. Granted, I did walk almost a mile before my last half because of where we had to park, but I don’t do any running to warm up. I do a few little drills and stretches and that’s it. I jog 2 miles and do some drills before a 5K. My half marathon pace isn’t super fast but I can see where someone really fast might need to do a warmup before it. I would feel weird negative splitting a short race. I’m scared that if I finished, I would feel like I could’ve given a little more? I’ve never negative split a race but it is a strategy I’m working on with my coach right now. This is great information, thanks for sharing. Oh, I don’t do negative splits but that doesn’t necessarily mean I start out too fast. I positive split but only by a minute or two. We’re all so different, the courses are all so different, the weather plays a huge role too, etc etc. I think it’s good to practice negative splits (you’re really good at implementing progressive runs into your training plan and fast finishes) and those are incredibly helpful for the last 10k of a marathon because for weeks we have taught our bodies to run on tired legs and push through the discomfort. I definitely agree – as a training tool they are invaluable because no matter what your pacing strategy, the last 10K of a marathon or 5K of a half HURTS. One minute or two isn’t a huge positive split in the marathon – I think even in the infographic it pointed out that most BQers ran like that. Oh and weather is a good point! A positive split is inevitable almost if it gets warm in the second half of a marathon. I think you hit the nail on the head that it really depends on the course. I did run a very well-executed negative split in my last marathon…but it was a flat course with the last few miles on a gradual downhill. It was almost hard NOT to run a negative split. I recently read an article about Olympic marathon qualifier Jared Ward, who did his masters thesis on marathon pacing and found that statistically speaking, the best way to run a BQ is to have splits that are as even as humanly possible (in his Olympic Trials marathon, there was only a 6 second difference in his 1st and 2nd half! ), and he personally likes this strategy because he finds it too difficult to ratchet down the pace mid-race. This is something that’s been on my mind a lot for Pittsburgh, because the course just doesn’t lend itself well to the typical”start out slow and work your way down” pacing strategy. The first 10 miles are fairly tame, there is a HUGE hill at mile 12, more rollers for the next 10 miles, then a sharp downhill at mile 23 and all flat to the finish. I will really have to think hard about my pacing strategy this time – it will be tricky and it makes me nervous. Flat courses are so much easier to negative split than hilly courses, I agree. My last half was on a flat as day course and I negative split that. I read that article on Ward and his thesis as well – so interesting! Even effort is what I’m thinking, as well. There’s just not many other options! At this point I think my best bet is to start pretty close to goal pace, get into it within the first few miles, and just try to hang on as best I can, knowing I might slow later but trying to limit the slowing so I can make it up in the last few miles. Here’s hoping!! I have only run negative splits when it’s barely intentional, and I think it’s because even when I consciously start out a little on the slow side, you never know how you’re going to feel by the middle of a half. I have absolutely no plans or concerns for the marathon to do so (just want to cross the finish line in hopefully less than 5 hours because I can’t imagine being out there for longer!) but I would like to try and not slow down TOO much. You said what I was thinking near the end…”race by effort”. I enjoy running…I have enjoyed seeing myself improve over the past few years and get faster. But, I do not feel that I have enough control over my pace to TRY and run positive or negative splits. So much of my running is purely by effort. Yes, I can push myself, but I have never tried to run a particular split in a race. I do get WAY to caught up in the numbers, though so if my first few miles of a half are “slow”, then I start getting in my head thinking that I am going to have a bad race. I always get so excited when I negative split anything, including a workout. It makes me feel so badass in a race when I’m able to pass people at the end and push really hard in the last few miles! It’s so hard for me to do it so whenever I realize it’s happening I feel so powerful and excited about my finish! I don’t try to run negative splits, necessarily, but I do get such a surge of excitement as I get closer to the finish line that I tend to speed up a bit just based off the adrenaline rush.